Introducing the Hand Skeleton Wire Mounted by 3B Scientific. It is a high-quality anatomical bone model brought to you by a prominent German-based company known for producing superior anatomical models and charts that are widely used by universities, hospitals, clinics, and medical offices across the globe. Anatomical models are primarily used as educational instruments for medical and scientific purposes. A pair of hands is capable of a variety of fundamental movements such as grasping and picking things up to more complex tasks like writing and drawing. That is why the study of the human hand is essential to anatomy and physiology. This realistic hand skeleton replica is a valuable addition to any bone collection. • The bones of the hand skeleton model are set on the wire. • It is slightly elastic down to the fingers to easily exhibit articulation and anatomical movement. 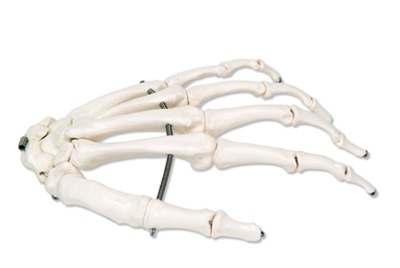 In addition to that, this realistic life-sized reproduction of the hand skeleton is naturally cast from a human hand bone specimen and the bones are produced from high-grade non-corrosive plastic that is totally durable and is sure to last for many years. HIGH QUALITY- The bones are made of high-grade durable plastic that is non-corrosive and is sure to last for many years. FUNCTIONAL- The bones of this hand skeleton model are set on a wire and it is slightly elastic down to the fingers to easily exhibit articulation and anatomical movement. REALISTIC- This realistic life-sized reproduction of the hand skeleton is naturally cast from a human hand bone specimen. HIGH QUALITY- The bones are produced from high-grade non-corrosive plastic that is totally durable and is sure to last for many years.